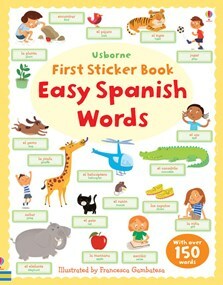 An entertaining sticker book with over 150 everyday Spanish word stickers for children to add to the pages. Humorous illustrations help to make each topic engaging and memorable, including animals, the body and clothes, family and friends, food, home, in the town, actions, colours and numbers. Children can hear all the words, read by a native Spanish speaker, on the Usborne Quicklinks website.